The recent price drop along with all the great reviews Ive seen about this firearm. Great pistol. Got one in black when they first came out and have enjoyed shooting and carrying last year. 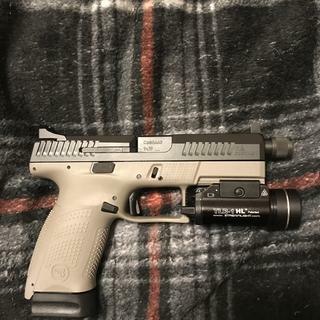 Decided I wanted a threaded barrel and it’s cheaper to purchase this new gun and sell off my current p10c than just purchasing a threaded barrel from CZ! Looking forward to the grey for a change! Been looking at them for a while, and the price was just right. Even had the old lady tell me to treat myself! Been looking for a P-10 threaded for a while. $399 was an impossible price to beat with threaded barrel and suppressor+tritium sights! I had already decided on the P-10 C due to it being the best bang-for-buck polymer handgun on the market. I just wish the magazines were closer the $25 a pop instead of $35. I Couldn’t pass on the price to quality ratio, not to mention the cost to features ratio. 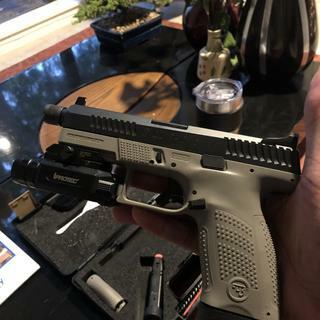 Cz is a world class firearms manufacturer, and the cost to upgrade to suppressor height night sights and a threaded barrel.... wow! I already own the p-10c with a regular barrel. Best trigger in the market that I’ve ever used. I own a glock 19 and VP9 and this is by far better triggers than those two. So I wanted to get one with the higher capacity and bought this also. Because I love this CZ! It is a hoot to fire! Amazing price for an amazing gun!!! thanks. $399 at the time I bought it and well that kind of screams no brainer to me. I acquired a P10-C when they first came out at 499. Love it, but so does my wife. This one is for me and at this price, why not. Merry Christmas to me. Been looking at one of these for awhile now. I hear nothing but good things about them and this was to good a price to pass on! I love my CZ pistol (Rami) and want to own their only striker fired pistol as well. Heard good things about this firearm.....also was highly recommended by an instructor of mine. Also love the two tone Urban Grey. Can't wait. GAG shipped quickly as always, had at my FFL in 3 days. Only been to the range once but runs flawlessly for 250 rounds. I bought this as my first handgun and I absolutely love it. I obviously don't have a lot to compare it against, but after shopping around quite a bit the features that come with this thing for the price are incredible. It shoots very nicely. I love the aggressive stippling, though as I've read it's a bit much for some people. It can be easily sanded down if it's an issue. The trigger is the best thing about this CZ. I’ve been eyeing these since they first came out and finally decided to get one, all I can say is I should have purchased sooner. It exceeded all my expectations and is a great pistol and an awesome shooter. I’ve owned many glocks and the cz p10c is much more comfortable all around and I couldn’t pass on the price I got it for. Shipping was super fast, ordered on a Sunday night and it was at my ffl Wednesday and there was a holiday in between. Overall extremely pleased and will be buying from grab a gun again. CZ P 10c guns are amazing! This is my 2nd P10c and I truly believe it is a better gun and a better value than a Glock 19. I love my Glocks but there are many features you get stock with a CZ that you would have to spend more money to get your Glock to this stage. Better sights, trigger, and grip. My pinky has a home on a CZ and I have to use a mag mod of some kind to make my Glock comfortable. 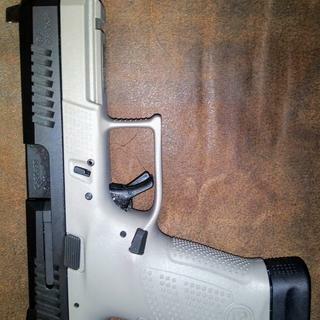 This particular CZ with threaded barrel and way cool Urban Gray was $399! An amazing value. Great gun and great buying experience in person in Big D! This was my first purchase with Grab a Gun. Prompt delivery, great deal, will order again! Enjoying the gun very much. Compliments my standard P10c well. Although, I swapped the barrels for daily carry. The threaded barrel dug into me pretty good. Already done one pistol course with it. Excellent pistol! Havent taken to the range yet but its a CZ! Plus I definitely got it for a great price $399!!! Zero issues shipped fast and arrived well packaged. This has been my third or fourth purschase from Grab A Gun and they are great! Definitely recommend buying from them and this wont be my last purchase. As always, Grabagun has great service and prices. Ships very quickly. My CZ P-10 shoots great with a couple hundred rounds through it so far. Love the gun! 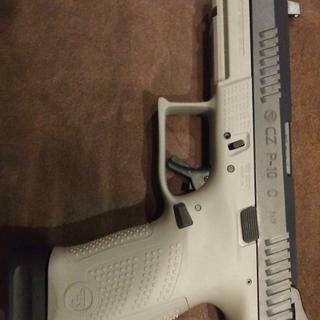 Liked the first p10C I purchased so much I got this one for use with a suppressor. Was told by Grab a Gun that the 15rd magazine from my original would not work in this gun. Do not believe it. They are identical firearms with exception of the sights and threaded barrel. Mags interchange perfectly. If you do not know the answer Grab A Gun, admit it. Incorrect info worse than no info. This is one of the finest guns I've ever owned - dollar for dollar, one of the best. On target first shot and every shot! This gun is (in my opinion) the best bang for your buck. This gun is unstoppable. It is ultra reliable and eats everything I feed it. The ergonomics feel great and it has an amazing trigger. It comes with a threaded barrel, metal suppressor ready night sights and an extra metal magazine. The only two cons for this gun are that the mag release is really tough and (again, in my opinion) a little big to carry concealed. Having said that, it is a great value for an amazing gun. Was delivered to my FFL dealer as promised. It is a great firearm for personal defense. Smoothest trigger I have ever felt out of the box.